Exceptional Value! Tankah / Tulsayab Beachfront Villa, Minutes from Tulum! Un-plug, relax, and reconnect with family, friends and nature at Casa del Perro Feliz. Enjoy ocean views from every room! Well appointed and well maintained, this 3 Bedroom, 3 1/2 bath beachfront villa is located on quiet, security gated, Tankah Bay minutes from Tulum and the Tulum Ruins. Tucked into the curve of the bay, the villa is built among the palms and the indigenous trees on a half acre lot, behind a large, gated, stone wall. 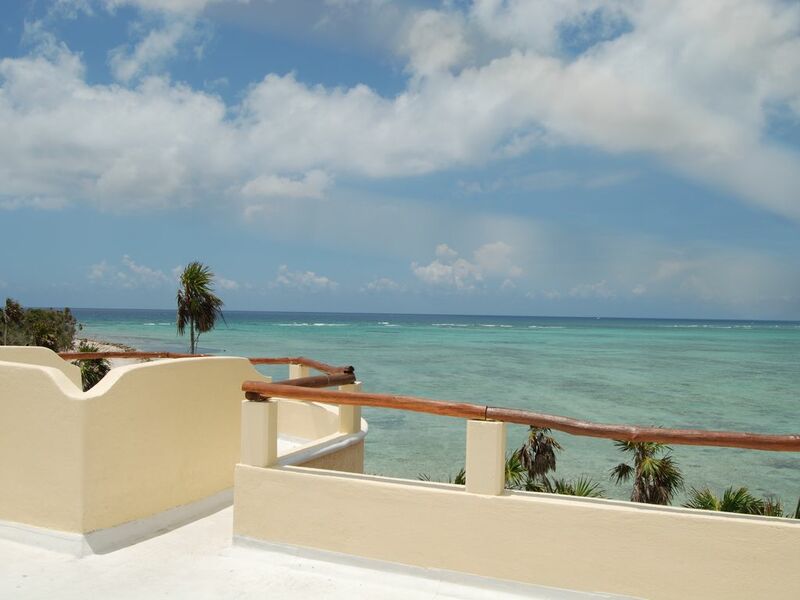 Casa del Perro Feliz has one of the larger lots on the bay with 99’ of beach frontage. The house is very comfortable and open, and has many windows with magnificent views. Our beach is quite private and is the perfect place to launch your kayak, go snorkel, or just take a dip in the calm warm Caribbean waters. The floor plan is very user friendly, and all bedrooms have en suite baths, pillow-top mattresses, box springs and cotton bed linens. The villa features an open floor plan with Mexican tile floors, Mahogany woodwork, a well equipped cook's kitchen, and handmade custom furniture. No trip is complete without a visit to the rooftop which features a built-in sofa which seats 6 comfortably, and has a million dollar view. Perfect for morning Yoga or relaxing with a Margarita or your favorite drink while enjoying the stunning views of the turquoise Caribbean. We love to watch the indigenous birds and the sunset over the jungle. It is the perfect way to end a great day at the beach! If you’ve never visited Tankah before, you’ll be delighted to see that it is a small community in between Tulum and Akumal, with nice beachfront homes, a few boutique hotels, all situated on a quiet, sparkling bay, with white sand beaches. We currently have 5 restaurants and a Dive shop and the Manati Cenote within walking distance from the villa. We have been visiting the area for over 30 years, and feel that Tankah offers the best of both worlds; nature & seclusion with nearby amenities such as shopping, restaurants and cultural sites. Casa del Perro Feliz has been the home away from home for many, many, satisfied guests. The volume of repeat guests is by far the best testimonial we could ask for! We invite you to visit Casa del Perro Feliz! For more information, or FOR MORE, RECENT REVIEWS please contact us - " Ask Owner a Question" !